New experiences are always tough. Whether it’s a first day at school or the first day at a new job. In most instances people are given time to adapt and find their feet but in motorsport you’re expected to hit the ground running and be able to find your pace immediately. 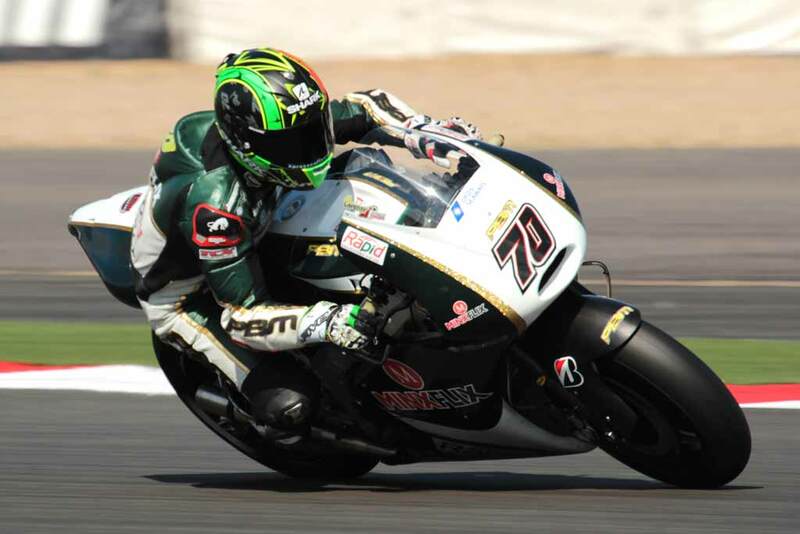 For MotoGP rookie Michael Laverty the challenge is compounded by a lack of experience in Grand Prix racing with the Ulsterman having spent the majority of his career racing Superbikes in Britain. Even so Laverty has adapted well to MotoGP and impressed many paddock regulars with a series of strong races to start the season, notably the Spanish Grand Prix at Jerez. Riding for Paul Bird Motorsport Laverty is also tasked with developing an all new bike with the British squad building their own chassis for the first time. On the opposite side of the garage Laverty’s teammate, Yonny Hernandez, is able to enjoy the benefits of racing on the proven ART machine. There is therefore no possibility for Laverty to share data with his teammate in a bid to increase the speed of development on the all new PBM bike. Aleix Espargaro continues to be the benchmark that CRT riders aim towards and while the Aspar racer has consistently been the fastest CRT rider this season, and routinely mixing it with prototype riders, there have been occasions where Laverty has had similar pace to the Spaniard. 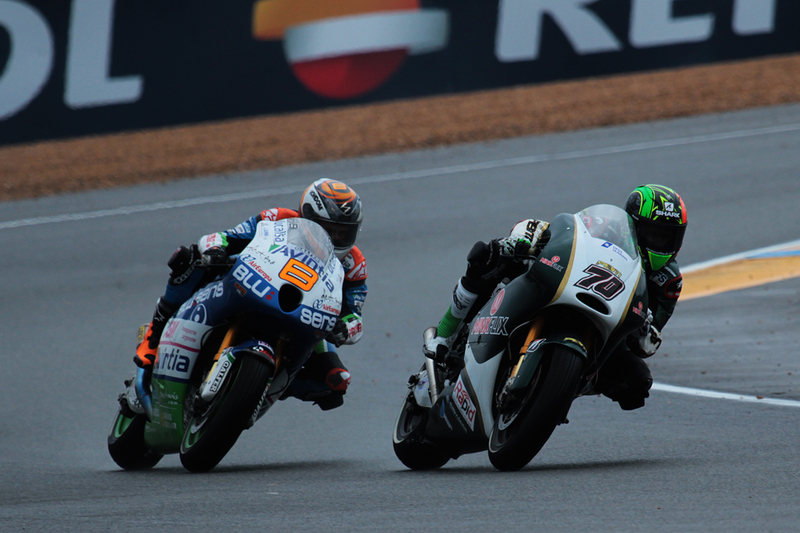 At Catalunya, one of Laverty’s stronger races, he was able to match the pace of Espargaro during his longer stints in practice but retired on the opening lap of the race. The season started strongly for PBM with their new bike proving to be quite competitive in the early races before falling towards the back of the pack as the year has progressed. Even so Laverty is confident that the team has found the causes of some of their issues and that solutions are close to coming on stream. Like any racer the rookie is keen to get on his bike and race but he also knows that spending time fine tuning his machine is a requirement for the first year that PBM has produced their own bike and as a result much of his time each race weekend is spent trying to find solutions to the problems that have bugged the team throughout 2013. The primary issue has been braking stability. 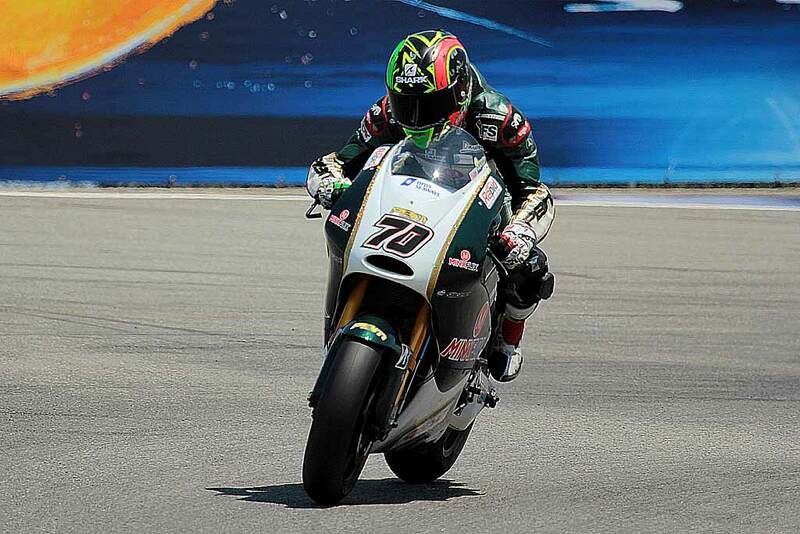 In the early races Laverty needed to trust the front end grip of the bike with the MotoGP Bridgestone tyres very different to the Pirelli tyres used in British Superbikes. This meant that the early races were spent exploring the limits of the tyres and trying to redefine his riding style to maximise grip under braking and initial turn in. “The nature of the corner affects our bike, it’s really hard to stop and that’s due to our electronics and the Aprilia engine,” commented Laverty. “On our bike we don’t have the exhaust control valve that the Aprilia is designed to use and without it the bike is hard to stop. We’ve got the latest spec engine but unfortunately with the Dorna supplied ECU we have no way to control it so we need an upgrade on the ECU to allow us to control it. “We’ll put in a request to see if we can use it in future. But that’s what we need to make the bike stop easier and it would fix a lot of our chassis problems. We’re at a level where need to find a way to stop the bike easier so that our braking zones decrease, our corner entry increases because we can release the brake faster and the bike can keep turning. It’s good that we have identified this area where the bike needs to improve but we need to experiment with the chassis to see if it increases braking support. 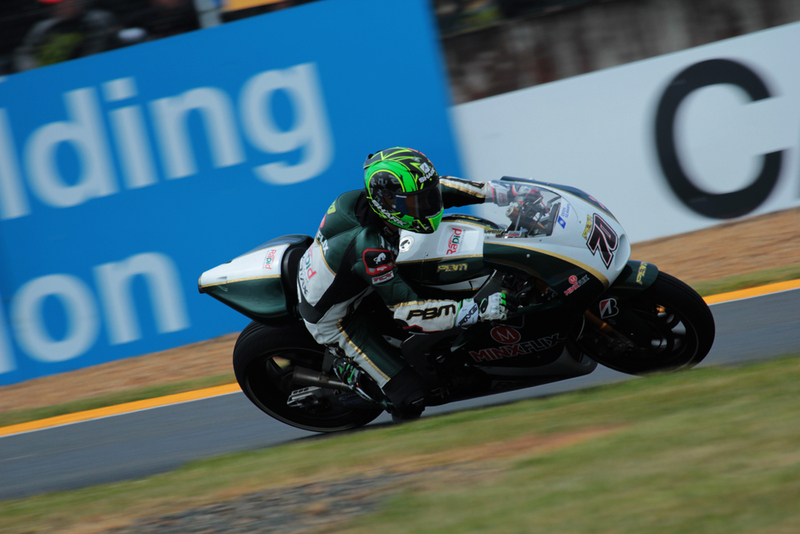 With limited resources and only one rider developing the PBM are faced with an unenviable task. To illustrate the challenge of developing a bike with only one rider a fair comparison can be made to the Moto2 class. In Moto2 Tech3 has struggled to field competitive bikes in part due to a only having two riders provide data to their team. 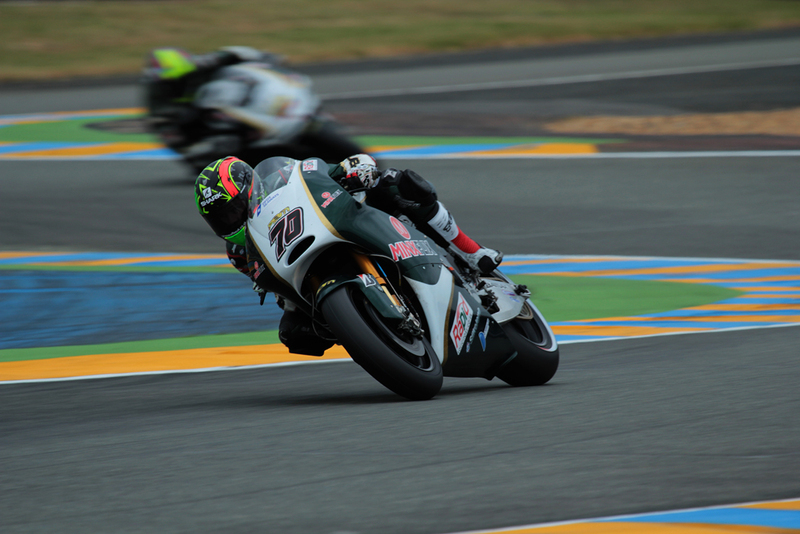 Even though they have had strong riders over the last couple of years, Tech3 has had MotoGP rookie Bradley Smith and Moto2 poleman Xavier Simeon, the French team still mark a successful weekend with scoring a handful of points. With data trickling through to Tech3 the armada of Kalex riders, such as Pól Espargaro and Scott Redding, has stolen a march. 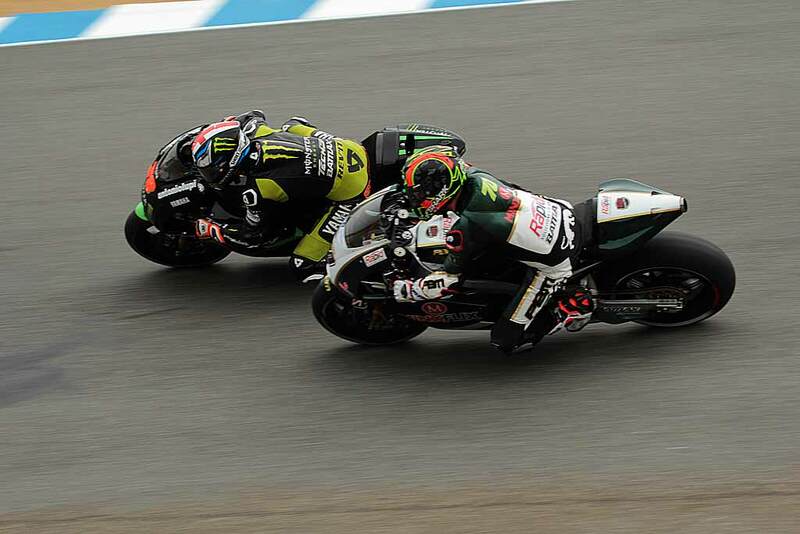 It is a similar story in MotoGP for Laverty and PBM. The season started competitively but as the year progressed the ART and FTR machines have made greater progress because of the added resources of having multiple riders providing data after each session. “Obviously we’ve all gotten frustrated with the lack of progress in recent races but that’s to be expected in many ways. We all want to make progress but this job is never easy; look at the resources and money that Ducati have spent and they haven’t made much progress. We’re a small team and we’ve come up with some ideas that didn’t quite work out but we’ve got to keep trying. 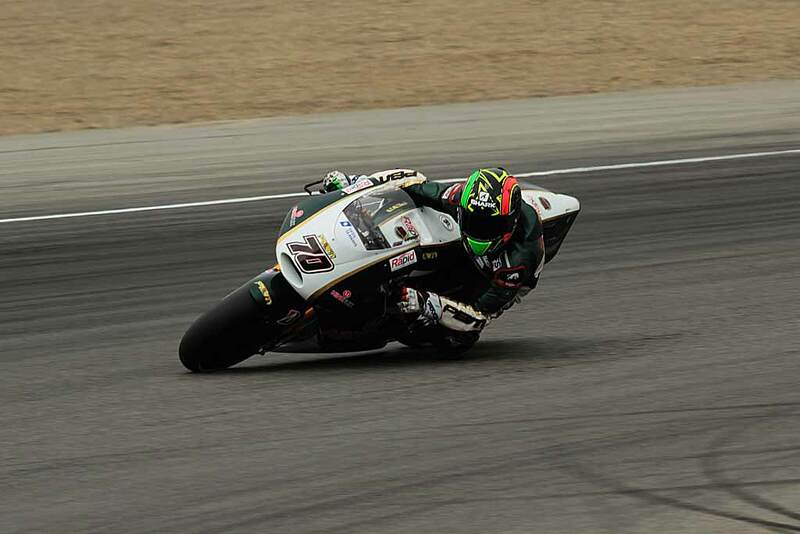 One area that Laverty and PBM are keen to exploit in the coming races is weight distribution. In recent races the team have tried various setup changes and Laverty has also adjusted his riding style to place more weight over the front under braking. Having watched video of his rivals he could see some subtle differences compared to his riding style. One of these areas was his stance under braking. 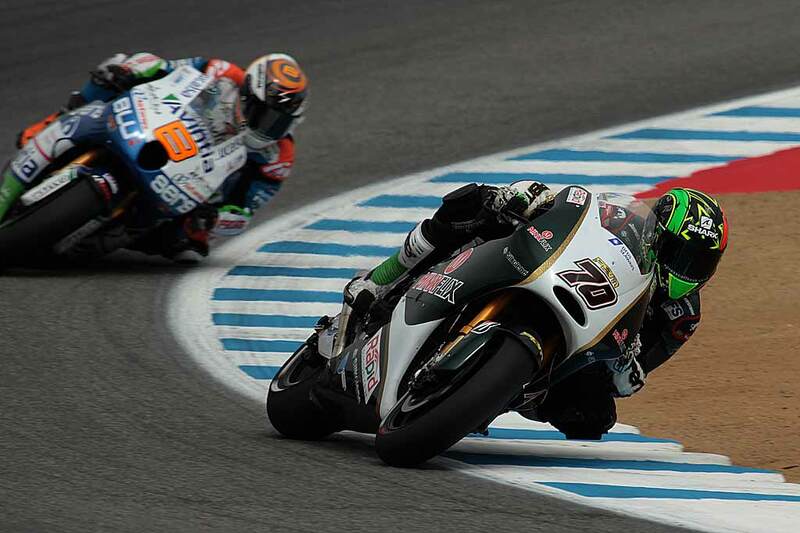 Whereas Laverty would lock his arms under braking, getting as upright as possible and therefore providing a lot of resistance to the air, the likes of Marc Marquez and Dani Pedrosa were hunched over the front of their bike trying to place more weight on the front of the bike to generate greater load on the front tyre. Adjusting your riding style is similar to trying to change your handwriting. It can be done but it is done with small and continuous changes rather than suddenly making a drastic change in style. Inherently riders maintain the same style throughout the careers and the subltle differences go by mostly unknown to the general public even though they can offer marked differences to the riders. “I’m still riding very smooth and on track I don’t look ragged but I’m on the edge. My style is smooth whereas someone like Marquez you look at and think ‘bloody hell he’s fast!’ whereas for me it’s smoother without big movements. It’s less action packed and lively looking but I’ve changed it to a degree this year. “I’m using the rear brake on corner entry more and it’s different. At Brno to get the bike stopped I had to brake all the way through the corner so at some of the corners I was at 60 degrees lean angle and still pulling 15 bars of rear brake. That’s a style that the Bridgestone tyres require and it’s something that you don’t have to do on a Superbike. Finding a way to get the most from himself, an all new bike and very different tyres has made this a season filled with challenges for Laverty but the former British Superbike race winner has made progress throughout the campaign and is confident that his plans for next season will be finalised in the coming weeks and that he will remain with PBM. There will be changes at the team next year with the team expected to also announce that both riders in their garage will use the PBM chassis, possibly with an updated Aprilia engine, and that is clearly a positive going forward that should help them make strides with the development of their chassis. When asked if he had any doubts about his plans for next year Laverty admitted that nothing was finalised but that he was confident of remaining with PBM. This entry was posted in Analysis, MotoGP and tagged Aleix Espargaro, Grand Prix motorcycle racing, Laverty, Michael Laverty, MotoGP, PBM, Pirelli, Scott Redding. Bookmark the permalink.